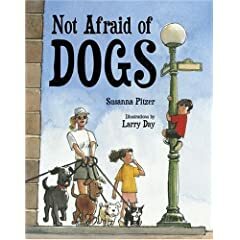 Not Afraid of Dogs by Susanna Pitzer with Illustrations by Larry Day is a perfect primary and preschool book to help children not just with the fear of dogs, but with fear in general. It's hero, Daniel, is a very brave little boy indeed. He isn't afraid of spiders or snakes or even thunderstorms. But, like all of us, he is afraid of something, and that fear is largely based on the unknown. Dogs are scary to Daniel. However much he refuses to own up to his fear, it continues to plague him. Usually, Daniel avoids dogs (often in hilarious ways). His dog phobia begins to pose serious constraints when his family offers to look after his Aunt's sweet little dog, Bandit. Fortunately for Daniel, the dog isn't shy about his own fear of thunderstorms. Once Daniel realizes that Bandit is even more afraid than he is, he forgets his own fears and comforts the terrified dog during a late night thunderstorm. By forgetting his fears to comfort another, he soon realizes how groundless they were. The is a gem of a picture book that would be perfect both at home and in schools and preschools. The text is simple yet rich in the emotional landscape it evokes. Dialogue effectively moves the story along reducing the need for extensive narrative. As well, the illustrations truly enrich the text making for a perfect marriage between text and illustrations. For example, Daniel's chair at the dinner table is empty while he is still insisting (from off the page) that he isn't afraid. The empty chair with Bandit sitting next to it says it all. And this is not just my opinion. This delightful book took home the Golden Kite Book Award this year for best illustrated picture book published. Re: bookstore returns. There is never any reason for rudeness when it comes to returns. What an unfortunate experience for your son. However, you should be aware that booksellers only have a certain amount of time that they can return a book too, hence their strict guidelines. I doubt the author could help with this as authors don't have anything to do with the publisher/bookseller relationship. Even if the new book comes out, authors are only given a few copies for personal use and then expected to purchase additional copies so it's not as if they can afford to send your son a complimentary copy. Why not try selling the book on ebay, then purchasing the new book when it comes out.